In 1924, a marriage agreement was made between G.G Shirian, an ardent devotee of Baba and his friend. It was purely a gentleman’s agreement. The gentleman’s son should wed Shirian’s daughter after completing his education. The boy completed his education. Hismarket value went up. More and more people began to offer their daughters to him, with “Varadakshina”. Sri Shirian was poor by their standards, but he had faith in Baba. He gave vent to his feelings before Baba’s photo, who appearing in his dream that night, assured him that He would give the same boy in marriage to his daughter in two year’s time. In the mean time, the boy’s parents were busy with negotiations and proposals. But each of the proposals fell through for some reason or the other. At the end of two years, the boy himself felt ashamed and told his parents, that all these things were happening – because they broke the agreement. Realising their mistake, the friend repented and the marriage took place in two year’s time as fixed by Baba. In the year 1928 Sri G.G Shirian in his official work was blamed and fined. He was hurt, as he felt that he was punished for no reason. That night he prayed before Baba’s photo fervently and asked Baba what mistake he has committed to warrant the punishment. Baba appearing in his dream told him not to worry, and that He would set matters right. When he went to the office the next day, he found that his superior had changed his opinion and had absolved him of the charge, but in his place an innocent boy was made the scapegoat. The boy was fined. Now the boy and Shirian both prayed to Baba for Justice. Baba again appeared to Shirian in his dream and said that the boy’s fine would be cancelled in 73 days. Trusting Baba, the boy did not go in appeal, nor did he plead for mercy. Exactly on the 73rd day, the boy’s fine was cancelled by the officer who had earlier imposed the fine. Baba is an embodiment of Truth. What He says does happen. Hon. Magistrate of Harda, Sri Krishna Rao Narayan Paralkar was a staunch devotee of Baba. For several years he had been celebrating Sri Dutta Festival by feeding a hundred Brahmins. The Dutta Festival / Jayanthi, usually falls in the month of December. Whenever he couldn’t celebrate the Dutta festival, for some reason, on a particular year, he would feed double the number of Brahmins on the succeeding year. That was his self imposed rule. The year was 1925. Saturday was fixed for the festival. On Tuesday, that is four days prior to the festival, while Sri Paralkar was merged in meditation as per his daily routine, He heard a voice, “if you desire that on the day when you are feeding the Brahmins, that I should come and partake the food you call Sri Dixit from Bombay.” Sri Paralkar, however, hesitated, that it may be improper for him to request Sri Dixit to come for dinner from such a long distance. While he was in the midst of conflict of thoughts, he again heard the voice. “Why are you hesitating? Write to Sri Dixit; feed him along with the Brahmins. When you have done so, know it for certain that you have fed me.” Sri Paralkar wrote to Sri Dixit on Wednesday. Saturday arrived and there was no news from Sri Dixit. Sri Paralkar during his routine mid-day prayers, again requested Baba to set matters right. Soon he received a telegram from Sri Dixit, informing him, that he is arriving with Madhava Rao Deshpande. Sri Dixit and Sri Deshpande arrived and took part in the dinner along with the two hundered Brahmins. Sri Paralkar was overjoyed and felt that Baba is still alive to satisfy the cravings of His devotees. In 1927, a couple was returning to Bombay by train after participating in the Ramanavami celebrations in Shirdi. The wife alighted from the train to fetch water. As she was getting into the compartment with the jug of water she slipped and fell down under the carriage. The train had started. The train could be stopped only after it had gone some distance. Everyone thought that the woman had been crushed under the wheels of the train. But the woman amazingly was back on the platform, unhurt, and smiling. As she fell down she remembered Baba. She said that Baba appeared from nowhere, held her tight in the space between the wheels and the platform till the train passed. Incredible! But it has come from the horse’s mouth. One Abdulla Jan was a Muslim Pathan from Tarbella near Peshawar. He was a young man, all alone in the world and moved from place to place. He was interested in visiting Mecca. When he came near Manmad, somebody suggested to him that a great man called Sai Baba lived nearby in Shirdi, who liberally showered money on fakirs, and that he may be helped to visit Mecca. When he first visited Shirdi in 1913 and stayed in the presence of Sai Baba he felt an animosity towards Hindus. But after a few years with Sai Baba, the animosity disappeared and he began to view the Hindus as his brothers. When Sai Baba left his mortal coil in 1918, Abdulla Jan was 22 years old. He left Shirdi and again travelled North. He thought that even though he stayed with Sai Baba, he could not go to Mecca nor had he been helped spiritually. He reached Swatvalley in the Karakoram range and found the tomb of a saint called Akun Baba, a sayyad and a direct descendent of Prophet Mohammed. There is a story around the Saint and his tomb. It is said that when Lord Robert was advancing to quell the Muslim tribes of North West frontier province of India, (as it then was), he could not move one foot forward from the place of Saint’s tomb. Lord Robert and his army were blocked up as it were, for three months and eleven days. This news reached Queen Victoria, who was naturally upset. Abdulla Jan having reached this tomb, pray that Akun Baba take him under his wings, and help him, as Sai Baba did not help him spiritually. He slept near the tomb. He saw in his dream Sai Baba, seated on a chair near his head! He felt that this is an assurance from Sai Baba that He still cares for Him. Since then Sai Baba appears to him once in two years. In 1928, a favourite devotee of Baba, Sri CK Raj Saheb Bahadur, an advocate, went on a pilgrimage to Dakshineshwar. He was particular of seeing for himself all the places and articles intimately associated with Sri Ramakrishna Paramahamsa. He particularly wanted to see the “Ram lalla” which Sri Ramakrishna used to play with. The guide accompanying Bahadur, showed him a huge idol of the size of Lord Venkateshwara and said that it was “Ram lalla”. The Bahadur was not convinced. But the guide asserted that he was correct. During this argument, a poojari came out of the Kali Temple and asked Bahadur, that his Guru Maharaj had appeared to him in his dream the previous night, gave him a description of Sri Bahadur, and directed him to take Bahadur personally around and show all the places and articles associated with Sri Ramakrishna. The poojari then took Bahadur around, and showed him the real “Ram lalla”. He was even allowed to take the Ram lalla on his lap. Sri Raj Saheb Bahadur was thrilled and overwhelmed at the thoughtfulness of Sri Sai Baba towards His devotees. Sri Bahadur had similar experiences when he visited other great saints like Madwanath Maharaj, Tajuddin Baba, Shilanath Maharaj etc. In 1929, Sri appaji Suttar of Shirdi had been suffering from eczema. He found no cure. He went to Kopergoan government hospital and was admitted as an in-patient. He spent Rs.200 there, but got no cure. He went to Nasik and was hospitalised again there. He had already been there eight days. On the eighth night Baba appeared in his dream and said “go back to Shirdi and read puraana”. Appaji said he had been hospitalised for cure of eczema. But Baba insisted that he go back to Shirdi, read puraana and apply udhi. Accordingly he came away from the hospital and began reading puraana everyday at 4 pm before Baba’s photo and began applying udhi. In seven days he was completely cured. The same Appaji had another experience in 1932. He owed Rs. 3,500 to one Multan Fatehand Marwadi of Shirdi, who was threatening to sue him and get him arrested. The frightened and worried Appaji turned to Baba for help. Baba appeared in his dream and asked him to recite certain stanzas of the Gita. His debt would be cleared. Sri Appaji followed Baba’s instructions. After this, one day the creditor came to Appaji’s House and Appaji was naturally frightened; but the creditor, came to tell Appaji to build a house for him, and on the completion of the house, he would write off the debt. Appaji gratefully accepting the offer completed the construction in a month’s time. The bond was returned. Appaji tore away the bond, expressing heartfelt thanks to Baba. In 1913, Atmaram Haibau Chambal, got specially made silver padukas and went for Baba’s darshan. Baba took them in His hands and remarked “How beautiful”. Then He inserted His two toes in the padukas and appeared to have been greatly pleased and said: “How nice they look. Take them and keep them in your pooja room and worship them.” And so he did till one day in 1930, when Chambal got up early to have darshan of padukas, where he had installed on a low wooden stool, one of them was missing. He searched under the stool and everywhere in the pooja room. It would not be found. It deeply disturbed him. However he continued the worship of the other paduka. A copld of months later, this also was found missing. He went to Bombay to have a replacement but were not realily available. He returned home and contended himself with the worship of Baba’s photo. He worried himself everyday, that he had lost the padukas, sanctified by Baba’s touch. Baba must felt satisfied with Chambal’s devotion. One fine morning when Chambal entered the pooja room for the daily worship, he could not believe himself when he found the missing padukas neatly placed under the wooden stool, as if they were always there! Baba teases and tests his devotees in various ways. Rao Bahadur Dhumal, an advocate of Nasik, did not take any important step without consulting Baba. He was also holding the office of Revenue Member of the Dewas state from 1930 to 1932 and was the Karbhari of the Surguna State from 1932 to 1933. One day while he was having lunch, the chief of Surguna State walked into his room. It is the practice with some elders that they do not get up, while having food. He apologised for the inability to get up and accord proper reception to the head of the Government. But the chief did not seem to mind, and he quickly walked into the next room, where Sai Baba’s photo was hung on the wall. He gazed for a while at the photo and returning to the room where Sri Dhumal was having lunch announced quietly and unasked a rise in his salary by Rs 50.00 p.m. Sai is a mother who looks after His children. In 1934, Sri Dahanukar’s son had measles, pneumonia and abscess on the chest. As the child’s condition was week the doctor was hesitant to operate on the abscess. Sri Dahanukar applied anti phlositine over the abscess and the abscess opened up. The doctor was still hesitant. So sri Dahanukar relied on his own doctor, Sri Sai Baba. He applied udhi on the wound, and prayed to baba. His friend one Vasanth Rao Jadhav, who later became D.C. of Poona, who was watching, asked him whether udhi cured the wound. “Yes” replied Dahanukar. “In how much time”? asked his friend “Just in 24 hours”, sai Dahanukar. That night Baba appearing in his dream chided Dahanukar, “why did you say 24 hours, you should have said immediately, your faith should be such.” Dahanukar apologised to Baba in the dream. The next morning the wound was healed. Sri Jadhav who had been a awitness to all this, took udhi from Sri Dahanukar and applied on his son who was suffering from pneumonia. The udhi was applied on the sixth day of the fever, and the fever stopped the next day. The doctor had opined that the fever would run its course of nine days. 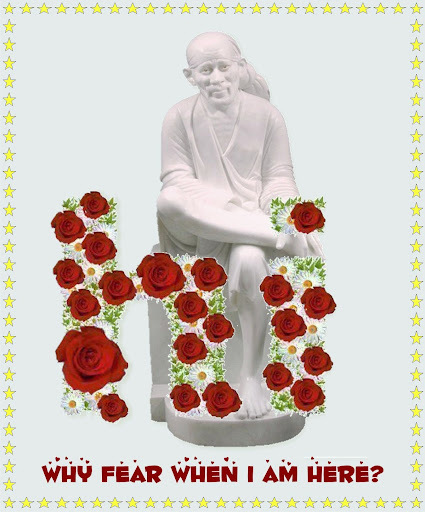 Sri Jadhav sent Rs.7.00 as his offering to Sri Sai Baba Samsthan, Shirdi. Sai Baba makes use of certain human agencies, as his instruments, to help humanity. Sri Keshaviaji, was Sub Registrar of Penukonda, Andhra Pradesh in the 1930’s. Worshipping Sai Baba with devotion, he acquired Certain powers. After retirement he devoted his life for the propagation of the name of Sai Baba very much like Sri Narasimha Swamiji and Sri Radhakrishan Swamiji. One day during his pooja session at Penukonda a boy who had been suffering from hip-joint consumption for four years was brought to his presence. The abscess had not dried up after all necessary medical care at Bellary and Miraj mission hospital. The Thursday pooja of Sai Baba at Penukonda performed by Sri Keshaviaji was largely attended. The boy was brought carried by two persons. Sri Keshaviaji looked at the time of the boy’s arrival touched the boy’s forehead and asked the boy to apply Baba’s udhi with coconut oil on the abscess. He further told the boy that he should attend Baba’s Thursday pooja for sever weeks. As foretold, at the end of the stipulated period, the boy’s wound dried up. He became normal. Pradhan, was an employee of the Revenue Department, Bombay. He lived in Sandhurst Road. His youngest son had high fever for four days. The doctor who was attending on him, found the pulse become weak, then irregular and then it finally stopped. He was pronounced dead. The boy’s father would not believe it. Such was his faith in Sai Baba, that he insisted that his boy was alive. There was nothing that the doctor could do. He gently persuaded Pradhan to accept the fact. But No! “Sai Baba is god, He will save my son,” cried the father in desperation. Applying Udhi on the boy’s face, he began to pray fervently. Minutes passed. Nothing happened. Forty five minutes passed not a soul in the room moved. Then the miracle happened. The boy revived, and sat up, as if he had been asleep. It is said that faith can move mountains. Page created in 0.299 seconds with 69 queries.